DEBORAH CROMBIE: Every so often you run across a book that you absolutely love. It may seem a bit odd that there are crime novels that create a world you don't want to leave, but it does happen. It takes just the right combination of story, setting, and character, but when it happens, it's magic. I've been a fan of David Hewson's books since I met him at the Book Passage Mystery Writers Conference in Corte Madera, California a few years ago. (I was on tour for In a Dark House, I think, so it's been a good few years! And that, by the way, is also how I met Hallie! It's a terrific workshop for aspiring writers.) I picked up one of David's Nic Costa novels, set in Rome, and was immediately hooked. So when I heard a few months ago that David had a new novel coming, set in Florence, called The Flood, I couldn't wait to read it. Here's a little synopsis. Florence, 1986. A seemingly inexplicable attack on a church fresco of Adam and Eve brings together an unlikely couple: Julia Wellbeloved, an art student, and Pino Fratelli, a semi-retired detective who longs to be back in the field. Their investigation leads them to the secret society that underpins the city, and back to the darkness in Florence’s past: the night of the great flood in 1966. Rich in the culture of Tuscany’s most mysterious city, The Flood takes a dazzling trip back into the history of Florence, recent and as distant as that of the Medici. The book is terrific--one of my best picks for the year. But David can tell you about it much better than I can. DAVID HEWSON: I’ve written so many books set in Italy that I have sit to back and count them. Lucifer’s Shadow almost fifteen years ago. Then came nine Nic Costa novels, mostly set in Rome. This is where the Nic Costa series actually starts.After that there was another Venetian kind of standalone, Carnival for the Dead which featured one of the Costa series most popular characters, Teresa Lupo. 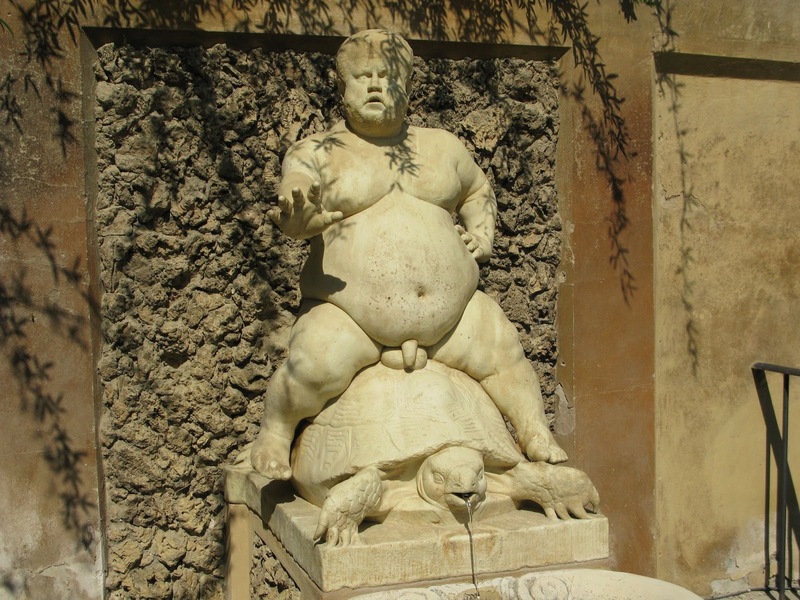 And now we have The Flood set in Florence, with scenery like the wonderful Medici dwarf in the Boboli gardens you see here. So that’s a round dozen. 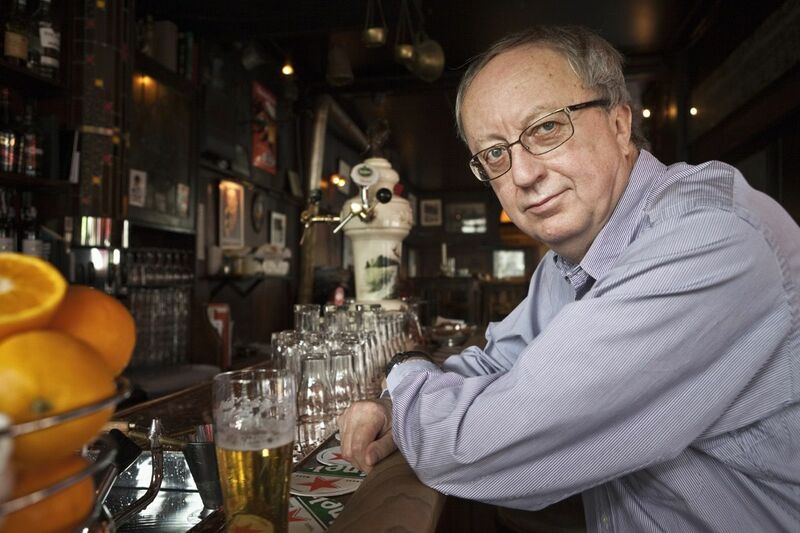 Over the last twenty years my books have encompassed Spain, the US, the adaptations of The Killing TV series in Copenhagen, and now a new crime series set in Amsterdam. The fact these are all lovely places to work and visit apart, why do I do this? Aren’t we all supposed to ‘write about what you know’? Well I don’t believe in rules for writing, and even if I did I wouldn’t think any of them were universal. ‘Write about what you know’ may be great advice for some, but rotten for me. My very first book back in the Nineties was set in a city much like Seville during Holy Week. I was a working journalist at the time and couldn’t afford the time and money to go there to research it. So I simply created a fictional Andalucian city and wrote the damned thing anyway. Semana Santa got me a three-book deal and was later made into a movie. And yes, I did get a few letters saying that I’d made ‘mistakes’ when it came to portraying Spain. But just as many saying I captured the true spirit of the place too. Five books later I made the decision to focus on Italy, moving to Rome for a while to enroll at a language school and try to see the world through Italian eyes. It was probably the best investment I ever made. Writing about what you don’t know works for me on many fronts. For one thing it makes me work, and if writing isn’t work then something’s wrong. I have to deal with a foreign language, culture, and history. I need to read background books and learn to navigate strange cities. I must pound alien pavements, taking pictures, imagining scenes. Those photos are important by the way and I still keep them. 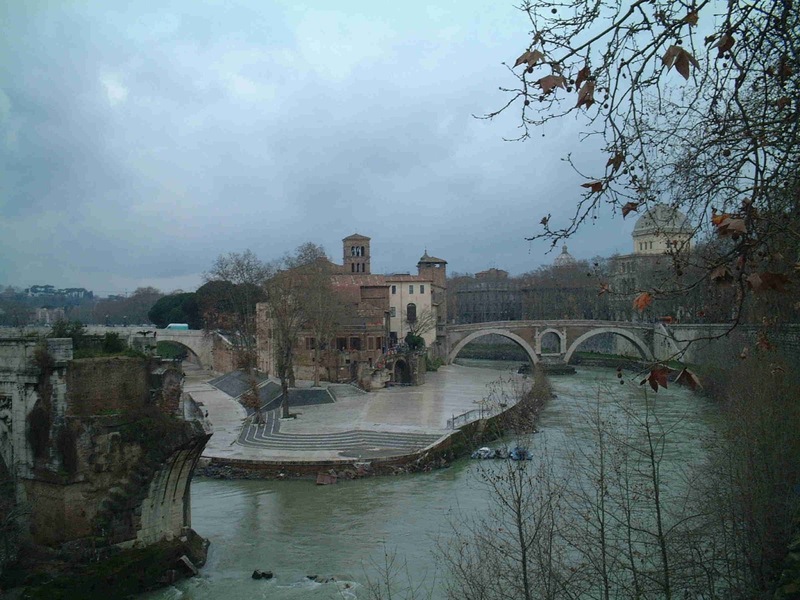 Here’s a grainy photo of Tiber Island taken on a rainy February day in 2001. Books must build worlds, in the heads of both author and reader. By assembling all this material about places I don’t know, I have to construct my locations from the ground up brick-by-brick. It wouldn’t be the same if it was London or some place around the corner. And the great thing is you develop a routine. In 2011, with my friend A.J. Hartley, I produced an audio novel of Shakespeare’s Macbeth. Now this is a fascinating play, but it’s full of holes. We’ve no idea, for example, why Macbeth begins as a hero and abruptly turns in a bloody villain. I hopped on a plane to Scotland and spent a week exploring Macbeth’s real-life Highlands — here’s a photo of Birnam wood, part of his comeuppance. It’s a beautiful part of the world, and there was the clue to his character. Our Macbeth is a patriot, killing Duncan to oppose tyranny, just as Brutus and Cassius murdered Caesar to maintain the Roman republic. Could I have got that out of a book or Google Maps? Not in a million years. The Flood is a standalone novel, not part of the Nic Costa series. While I tried quite hard to picture a Costa book set in Tuscany every effort stumbled on a simple obstacle: the characters don’t fit. Romans are southerners, colourful, sociable, outward-looking. Whereas Florence has a darkness to it, a grim side visible in the fortress-like architecture of its rusticated palaces. Rome has always been a show-off, keen to display its glories to the world. Florence, especially under the Medici, preferred to keep them hidden and show them only to the privileged few. It took a lot of visits before that became clear, and only when it did could I began to grasp the story I wanted to write. The tale begins in Rome in 1942 where a young Jewish boy is being smuggled out of the ghetto to keep him out of the hands of Mussolini’s thugs. We then move forward to the winter of 1966 and a terrible real-life flood which claimed more than thirty lives in the city. Then, for the bulk of the story, we find ourselves in 1986, dealing with two far from complementary characters desperate to unravel secrets from both those previous eras. One is an eccentric carabinieri officer, Pino Fratelli, the second is a young Englishwoman, Julia Wellbeloved, fleeing a failed marriage, thinking she can find herself in the art and history of Florence. I want the reader to feel they’re there walking the streets with Pino and Julia, feeling her disgust when he stops for a Florentine snack of tripe, and his wonder at the marvelous paintings in the Brancacci Chapel and San Marco. I can’t think of any way to achieve that without going to the place myself. I know. It’s a tough life. But someone has to do it. Jules Verne wrote Around the World in Eighty Days and he’d never set foot outside Europe. 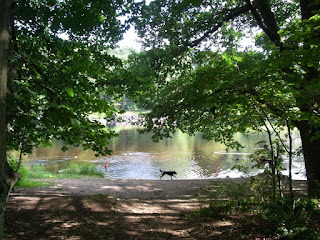 But today the world’s a smaller place, which makes it so much harder to create a vivid version of it for readers’ eyes. So what do you think? Can you write convincingly about somewhere without going there? Or is fiction just that… made-up stuff and the secret’s in the making? DEBS: You can probably guess where I stand on David's question. I think writers can build any world they can imagine, convincingly, but it does take work. REDS and readers, what do you think? And David, I have to ask: Wellbeloved is such wonderful name. How did you come up with that? David will be dropping in to respond to comments, and will pick a lucky commenter to receive a copy of The Flood. One last thing, although certainly not least. Be sure to follow David on his blog, where you'll find some of the best advice I've come across on writing. And David's book about writing a novel, Writing: A User Manual, is a terrific resource for both new and experienced writers. I'm hoping he'll come back and talk to us about that! Hi Deborah - flattered you loved the book! As to the name 'Wellbeloved'. It's an old, relatively uncommon English one that was originally applied to someone who was, well, loved by all. Julia doesn't feel this way of course since she's just been through a messy divorce, as Pino, being eagle-eyed, spots straight away. I'm a bit fond of names that mean something. Pieter Vos for example -- Vos is Dutch for fox and he's quite a foxy character. My favourite Italian surname is Esposito, literally 'exposed'. It was the name monks gave to orphan children left on the steps of their monasteries, abandoned by their mothers. David, I don't think I could write about a place I didn't know. Writing stories that take place in areas I'm part of has a way of creating the movement and life of my characters and the crimes they are connected to. What I find difficult about it is keeping from turning it into something too memoir-ish. David, I love your small book about using Scrivener and have recently bought your book for writers, which I love. I don't know why but I only recently discovered your books. Special thanks to Debs and Diane for that! Hi David! Yes, I certainly believe that it's possible to write about a place (and time) that is not yours. Research, observation, and imagination--to me those are the fundamentals of any good writer--no matter where or when the story takes place. Deborah is brilliant at this! And don't get me started on my favorite historical mysteries! And not just the series--The Name of the Rose, hmmm? And can't wait to get my hands on Julia's latest--the flashbacks to an earlier time in the life of Russ--well, I'm champing at the bit to read this! I love your take on the differences between northern and southern Italy--and am looking now to see how many of your books are in my library system! Fabulous post, thanks Debs and David! I'm going to put all these books on my pile. I fall in the camp of preferring to have been in the place in order to write about it. I take a lot of inspiration from what I see when immersed in Key West--I notice things I can't imagine making up. But Reine has a good point--we need to remember we're writing fiction, not memoir! I write about places I've visited or lived, backed up with internet research for specifics (bus route numbers, flora and fauna). I take lots of reference photos: architectural elements, flowers, streetcars, food, store fronts, signs, murals. Looking forward to reading your book. "Florence has a darkness to it"..oh. It does! I could never put my finger on it. I love Florence, but, yes, I agree it's sinister. ANd I will understand it differently now because of you! Ah, well, reality. I think it helps, it rally does. YOu CAN make it up--I mean, we do. But there's nothing like the "impression" of a place, and that's only from reality. ANd since people love reading about places they know, best to get it right. Or--right enough with the addition of made up stuff. ANd everything sounds better in Italian! SO lovely to see you here today. Thanks for all the interesting feedback. Of course I wasn't saying you have to go there to write about it. Just that Ihave to in order to write these books. If you're writing historical or science fiction you've no choice but to make it up, though I still think you have to create a multi-dimensional world that feels real in order to succeed. The key difference for me lies in the scope of the imagination. Mostly I think this is visual. We see dreams in the main, and other senses are either muted or absent. But I want readers for these books to be there, inside the world itself, smelling the stink of the drains and the perfume of the flowers, tasting the Negroni and the fennel salami, feeling the heat and cold, the cobbles of the stones, hear the rumble of traffic down the narrow lanes and the chatter of voices in the market. We don't experience the world through sight alone but through all our senses -- hearing, taste, smell, touch. If you write from imagination alone you have to work to bring these things out and not just rely on visual description alone. But if I can get the 'real thing' as background - and living in the UK Italy's just two hours from me - it's a sight easier to hop on a plane and find it. Hey, David (waving!) I got to spend time with David at two Book Passage Mystery Conferences. I remember the first book of his I read, The Lizard's Bite - I'm still haunted by those hellish images of a Murano glass furnace. I'm writing a book set in Beaufort SC and realizing I need to go there (though I've visited several times) with an eye specifically to writing it. So, because I'm food obsessed and even though I know this is a stupid question, David, what's your favorite place to eat in Rome? What would you order? And can you stand Campari? And now going to order a copy of THE FLOOD. Hope we run into one another again before long. I like this restaurant a lot in Rome. It's near the Piazza Navona but it's very real and local, even down to some stupendously rude waiters on occasion. If you want to go very wild and local you need to eat offal in Testaccio here - and you will pay for it. I like a spritz Campari in Venice. Doesn't taste the same anywhere else. I've always been more of a fan of "write what you want to know" not "write what you know." And yes, doing that takes a lot of work to make it "real" for the reader. Maybe someday my travel budget will allow me to do some field research outside of Southwestern PA. I, too, am a huge fan of the Nic Costa books. Having never been to Italy, they do make me feel as though I know what it is like. I think that is a gift that many authors are able to give to readers. The new book sounds fascinating. Having spent a week in Florence, I could never quite verbalize what was singular about the place, but "dark" is exactly right. Even though it was mostly sunny when I was there, the ancient, narrow streets are dark and secret. The idea of a private passage along the top of the Ponte Vecchio so the prince could cross the river unseen adds another dimension to that feeling. Even the covered aspect of the bridge changes the character of the city, doesn't it? I tried Campari once. Do not get the appeal. It looks as though your new book is only available in hardcover. No e-book? At least not a Nook version. The book isn't out until October 1 but I'm sure there will be ebook versions too. I was lucky enough to walk down the Vasari Corridor, as Julia does in the book. Quite something, and lined with self-portraits from several centuries. Thanks for the reply, David. Best of luck with the new book. I've had a Campari spritz in Rome, and I think David's right. It doesn't taste the same anywhere else. Is the same true of Negroni? It seems like I tasted one somewhere--London, maybe?--and thought it was awful. But I like gin and the drink sounds so good when Pino and Julia are having. It fits the place and the characters. I had to laugh reading David's comment about sensory cues. On Sunday I was cooking some potato and yellow squash soup and I was suddenly transported from my kitchen to England and the smell of someone cooking boiled vegetables for a Sunday dinner--although in England there is usually cabbage in there along with the potatoes. Smell is most evocative of all the senses, I think. So you can start by writing what you don't know, then learn about it, but I think at some point you have to have personal/sensory experience. 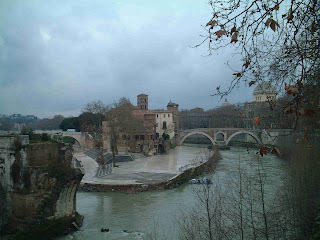 Hopefully writers of historical novels can visit places, if not the time, of their stories. And writers of sci-fi and fantasy have to use transference, substituting sensory cues that both they and the reader find familiar. Otherwise the reader has no way to connect. Can you tell I'm feeling homesick for the UK? I wouldn't dream of trying a Negroni outside Italy. They'd get it all wrong. They do in Italy sometimes. It is pretty powerful stuff but with food, especially in winter which is when the book is set, it works for me. Here is Pino's bar -- it's been tarted up since his day though. If you saw the weather we're having right now I think your homesickness might vanish Debs! I like the idea of writing about a place you don't already know, forcing yourself to do the necessary homework. I can imagine writing about a place that I think I know and getting key details wrong because I thought I didn't need to go back over things, as I would know I needed to do when writing about a new place. OTOH I love the idea that you captured the spirit of a place even while getting some details wrong. I haven't met Nic yet but will make a point of doing so! This book sounds so very interesting. Must go to Amazon and check out more of David's books. I love books that make me feel like I am right there and involved and experiencing that moment. Another great read for me to check out. Thanks Deborah and David! Thanks for this introduction! I have read all of Donna Leon's books, and so I expect to enjoy these. Italy has such incredible layers of history. Oh! BIG David Hewson fan here and this one sounds fascinating!!!!! Thanks for introducing yet another author new to me and especially one that writes about Italy. The Flood is going to the top of my pile. I worked with bookbinder whose teacher --- Stella Patri --- helped to restore books damaged in the flood. Am looking forward to learning more about it along with Julia and Pino. And I totally believe a writer can write what she/he doesn't know: that's imagination at it's finest, when done well. In less than 3 weeks, I will be IN Florence (because I HAVE to go back)so I'm so ready to find this book. Not until October eh? Sigh. Wellbeloved. Wasn't Cyril Wellbeloved the name of Lord Emsworth's pig man, well beloved by the Empress of Blandings? And Esposito, of course, = hockey. It is an extraordinary story and not well known because at the same time there were terrible floods in Venice, not that there were any fatalities there as I recall. There are some extraordinary images here https://www.youtube.com/watch?v=ghWwhwEFwqA but the height of the flood was at night so the worst of it was never recorded. Well it's October 1 the book is out so maybe... I don't know about the pig man but I remember a Labour MP called James Wellbeloved who defected to another party. The then leader of the Labour Party later referred to him as "the inappropriately named Wellbeloved". Maybe Lucy's up for the offal... with a side of skate. Here's a Negroni recipe. It's pretty basic. The big difference seems to whether or not you serve it on ice or straight up like a martini. I think I have the vermouth but not sure about the Campari. I could use a little Italy at home, but will maybe pass on the tripe:-)! What an interesting post, David! I would think that it's in the nature of writers to want to expand their knowledge and write about new horizons. I know as a reader, I am thrilled to learn about new places, people, and events. By new, I mean new to me, as I revel in places that have long, often dark histories. I've often said that Debs' Gemma and Duncan series is like a guide to the different areas of London, full of rich history as to how the area arrived at its current place in London's map of cultural and social markings. While I completely embrace the idea of writers writing about what they don't know, doing the research, and bringing that new knowledge to readers, I think that an on-site familiarity with the setting would be a needed part of the research. Sometimes in visiting a new place, I can feel the history soaking into my pores. David, your trip to the Scottish Highlands to capture that sense of place for Macbeth is a perfect example of the need to get in touch with a place, to feel it. I hate to admit that I am new to your books, David, but that also means that I have a whole new world to explore through them. I haven't read a lot of Italy based novels, so I look forward to addressing that gap. 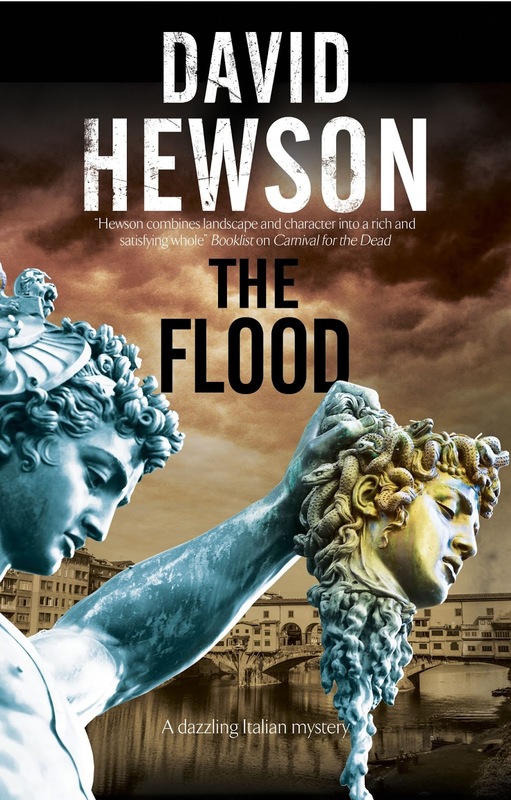 The Flood sounds like the perfect book to start with in your oeuvre. Diane Hale here. Thank you, David, for being such a thoughtful novelist and writing guru. I agree with the responses that being "there" gives those special sensory cues that can be so valuable to a writer. I also agree that whether you've seen it or not (as in sci-fi or fantasy), the world building has to be there. If the writer can't communicate that a story can fall flat. Keep up the good work, and I look forward to reading The Flood. I've been to Florence and love the city. This sounds like a book that I have to read. Will there be more Nic Costa stories. I miss him and the gang. I love reading stories set in places I've never been to. Then I yearn to go visit and see how it compares to how I imagined it. It All Happens at the Library!